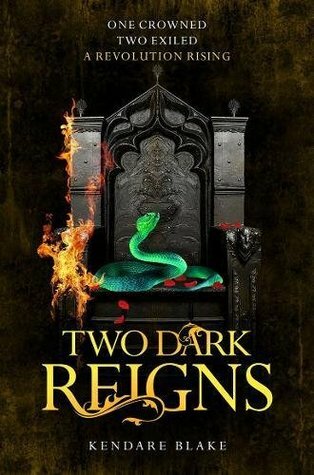 Two Dark Reigns picks up just where One Dark Throne leaves us. The world of the Queens of Fennbirn is now very different with Katharine in power and Arsinoe and Mirabelle exile from the island. It was really interesting to see how the Arsinoe and Mirabelle coped on the mainland. Their powers are diminished and they are trying to fit into the ‘normal’ world but the island is pulling them. Back on the island, things are getting quite mysterious. The unexplained mist keeps appearing, leaving death and devastation in its wake. Jules has unexpectedly become the face of the new rebellion, taking her place as the Legion Queen. Finally, with all the Queens back on the island we see the rebellion and the royal bloodline meet with devastating consequences. I loved this book SO much. There was so much going on in so many different ways and I loved how the main POVs all came together for THAT climax towards the end. The very last few pages of the book had my heart pounding – I really, really hope that what is hinted at isn’t about to happen!! I’ll be so disappointed in that character if it does. Getting to see different characters coming more to the front in this book was a real treat as well as getting to know more about the island and its mythology. I adore the world building. Being back with Arsinoe, Mirabella, Katharine and especially Jules was such a highlight. I slipped right back into their worlds, their pain, their heartache, their ambition. This book definitely peeled back even more of the layers from some of our leading ladies and I can’t wait to see what will possibly be revealed in the final book. Whilst writing this I’ve just remembered something SO sad that happens in this book and I won’t be forgiving Kendare Blake for that any time soon. If you’ve read the book you’ll know what bit I’m on about. Two Dark Reigns was the perfect third book in this quartet. It packed a punch with all the action and plot, the characters continue to capture my heart and a part of me even wishes to visit the island for myself. I’ll be so sad when this series ends, I have unexpectedly become totally obsessed with these Queens, their courts, their powers and their world. Thanks to MyKindaBook, Nina Douglas and Kendare Blake for my NetGalley version in exchange of a fair and honest review. Have you read Two Dark Reigns? Is it on your TBR? If you’ve read the series, which gift would you want?